6,824 Artworks have been viewed 6,824 times. 7 Artworks have been added to favourites 7 times. Ernst was born in Vienna and began his training at the Academy of Fine Arts in Vienna. In the early 1870s Ernst traveled throughout Italy and settled in Rome to continue his education. 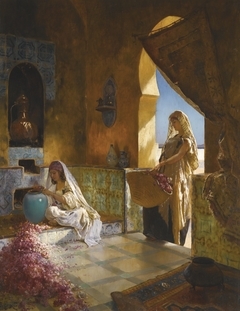 In 1885, he began to create Orientalist paintings, for which he achieved almost immediate fame. Seeking new subject matter, Ernst traveled to Morocco, Spain, Turkey, Constantinople, and Egypt. He eventually settled in Paris, and for six decades he successfully exhibited at the French Salon. Although there was an entire school of 19th century Orientalists, Ernst won the public’s admiration for his expert skill at rendering intensely detailed tiles, textiles, and artifacts. Austrian/French Painter. 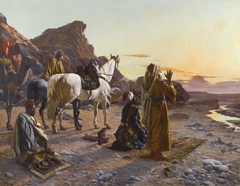 Rudolphe Ernst exhibited his works at the Salon de la Société des Artistes Français for over sixty years and is today one of the most celebrated and sought-after Orientalist painters of the nineteenth century. In 1876, Ernst settled in France, exhibiting regularly. After an initial interest in portraits, images of children, and genre scenes, Ernst turned in 1885 to Orientalist subjects. 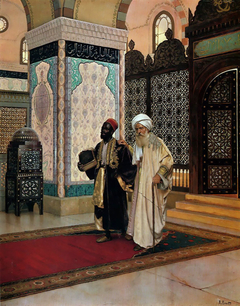 The artist’s first taste of the East was sparked by journeys to Spain, Morocco and Tunis in the second half of the 1880s, followed by a visit to Istanbul and Egypt around 1890. Whilst on these travels he became very interested in the eastern styles of decoration, in particular tile-making. Composed in his studios in France, Ernst’s best-known Orientalist subjects include colorful portrayals of the traditional professions and customs of the Ottoman world; harems and scenes of female daily domestic life; mosque interiors; and tigers. 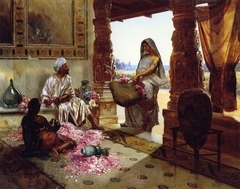 Though the entire Austrian school of Orientalists seems to have had a fascination for such scenes, it was Ernst (along with his friend Ludwig Deutsch) who virtually monopolized the field and captured the public’s attention. In 1900, Rudolphe Ernst moved from Paris to Fontenay-aux-Roses, where he lived a quiet and somewhat reclusive life until his death in 1932.